Arthur's Pass Outdoor Education Centre: Welcome!! Hello and welcome to The Arthur's Pass Outdoor Education Blog Spot. 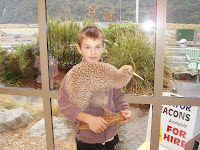 Pictured is a Great Spotted Kiwi/ Roroa (held by Finn). At the lodge we have a male Kiwi living in the bush out the back. Kiwi can often be heard at night in the village, but they are almost never seen, as they are nocturnal and very elusive! 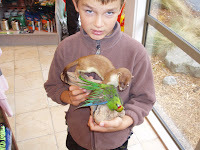 Here Finn is holding a stoat (pictured eating a Kakareke). Stoats love to eat our native birds, as well as birds' eggs. 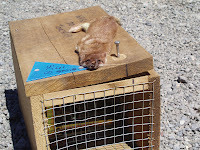 In Arthur's Pass Village a number of local volunteers trap stoats, so that Kiwi and other important and rare native birds have a safe place to live. This is what the stoat traps look like. On top is a squashed stoat. That's one less predator for our local Kiwi! Thats predator! I cant seem to edit the text once put in!